Better late than never as Ford agrees to build the latest version of the award-winnning European Focus in the U.S.
Out with the money losing old, in with a new Focus. Loss making Ford Motor Company unveiled this morning a $550 million changeover at its Michigan Assembly Plant in Wayne from building trucks to assembling smaller, more fuel-efficient vehicles. The changeover represents a historic about face for executives at the struggling automaker, which has relied heavily on its truck line for the past 20 years. At one time Michigan Assembly, aka Michigan Truck, was said to be the most profitable auto plants in the world, as the Dearborn-based maker reaped billions of dollars in profits from the gas guzzlers that were produced there. The revamped “lean, green and flexible” manufacturing complex will build Ford’s next-generation Focus and a new battery-electric version of the Focus for the North American market. Ford executives had previously objected as “too expensive” a plan for assembling the latest version the award-winning European Focus in the U.S. Instead a warmed over version of the old generation Focus was kept in production and bodystyles cut back — just as demand shifted sharply to compact cars as fuel prices sky-rocketed here. The new Focus will begin rolling off the line next year and a battery-electric version of the Focus – Ford’s first all-electric passenger car – debuts in 2011. The Wayne plant had previously built the Ford Expedition and Lincoln Navigator sport utility vehicles. 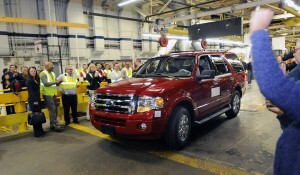 The SUV production has been transferred to a Ford assembly plant in Louisville, Kentucky. Sales of both are down markedly and its not clear how long they will survive. The reinvention of Michigan Assembly is rooted in the fundamental strategic shift by Ford to leverage its global assets to bring six small cars to the American market by the end of 2012, Ford officials said. To produce the vehicles, Ford is converting three truck and SUV plants to car plants – Michigan Assembly, Cuautitlan Assembly in Mexico, which begins building the new Fiesta subcompact early next year; and Louisville (Kentucky) Assembly, which will be converted to produce small vehicles from Ford’s global Focus platform beginning in 2011. Over time, the new platform will be the basis for more than 2 million units annually around the world, including Focus and other derivatives, allowing Ford to leverage economies of scale to improve investment efficiency. Previous Ford attempts at the globalization of platforms going all the way back to the “Ford 2000″ plan announced in the mid-90s failed. The so-called “zero-emission” Focus battery-electric vehicle is being developed in partnership with Magna International, and features a high-voltage electric motor powered by a high capacity Lithium Ion battery pack. It can be charged by plugging it in to a 110-volt or 220-volt outlet. It appears to be a limited volume demonstration program at this time. The vehicle is one part of a larger strategy Ford announced in January to develop electric vehicles for North America. The $550 million investment in Michigan Assembly includes more than $430 million in manufacturing investment at the site, as well as $120 million for launch and engineering costs. In addition, Ford will be making a “significant investment” in supplier tooling to support the plant. Ford Motor Company also invested $200 million in the retooling of its Kentucky Truck Plant for production of the Ford Expedition and Lincoln Navigator. The retooling at the Louisville Truck plant includes the installation of a flexible body shop that will allow the plant to produce 2009 model Expedition and Navigator SUVs alongside its popular Ford F-Series Super Duty pickups. The Kentucky Truck Plant makeover is part of a move by Ford toward leaner and more flexible manufacturing across its North American plant lineup, though it clearly still lags Toyota and Honda in flexible manufacturing efficiency and capabilities. Well this is a move in the right direction. This car could be a big seller for Ford. Too bad with all the Chinese tooling and cars built in Mexico. There won’t be many Americans able to afford these cars. Oh well, at least my tax dollars are not being used on this project. GM is going to use bailout money to import cars from China. Buy American? Charity starts at home. I buy American made. The money stays here. Does it cost more -yes – but it is worth it. United we stand.